Manufacturer of a wide range of products which include steam generators. Our company is well known for supplying extensive collections of Steam Generators to our valuable clients. 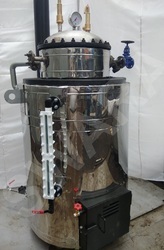 The Steam Generators that we deliver to our customers are of excellent quality. These Steam Generators are specially designed Non-IBR Type Heat Exchangers with Higher Heating surface in minimum space made from M.S Plates conforming IS 2062. & SS 304L Seamless Tubes. Boiler is of welded construction with engineered water & steam flow. Boiler is insulated to minimize the heat loss. Steam generator will be provided with Tested ISI mark Steam Valves, Pr. gauges, Safety Valves, Level gauge,. Increased H.S. & S/V ratio gives efficient heat transfer. Looking for Steam Generators ?